As you can see, the syntax is quite simple and user-friendly. It can be later edited manually, you don't have to delete the whole code and generate it again should you require to perform any changes. Make sure to publish both the System - RSTemplate! and the Button - RSTemplate! 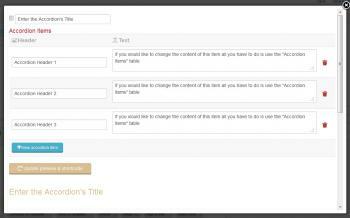 Accordion plugins in order to have this functionality available in your editor. This can be done in Extensions >> Plugin Manager.